Answer: All it takes is knowing how. Many beautiful vegetable and fruit flowers and fruit arrangements are suprisingly simple to do once you know how. 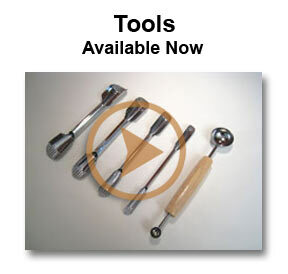 You can have successful results with your first try using tools that you already have in your kitchen. A little practice will improve your results. Answer: Hearing that question so often is what prompted me to create my course on veggy and fruit carving. How? Most people learn best by being shown how. The combination of seeing it done and hearing how to do it makes for the fastest and easiest learning. That’s what we do in our vegetable and fruit carving instruction course is to show you and teach you using high quality video. We start with projects that will easily give you great results and basic skills and progress to more advanced techniques. You can successfully be creating your food art and fruit arrangements right away. My course will save you from wasting your money on books that that don’t fully demonstrate how to get the desired results. In my quest to learn how to carve vegetable and fruit flowers, I looked for books in local book stores, national chain bookstores and cooking shops but was unable to find anything but to most basic garnish pamplet. So, I went online to order some books. What a disappointment! I found a book with pretty fruit flower arrangements on the cover and it was highly recommended by other readers. But, it turned out to be a selling tool for a company that manufactures fruit and vegetable carving tools that I was unable to order in the U.S.A. Almost all the lessons in the book required the specialized tools most of which I could not locate to purchase. The next book that I received was laughable. The projects were so childish that I would only make them for a small child, if I were to make them at all. They were so uninteresting! One of the projects involved taking lemon and insert two cloves for eyes and one for a mouth and Voila, you have a teddy bear. That was it! Really! I can’t believe I paid good money for that but I was not able to see what was inside the book before I paid for it. The next book I ordered had some pretty fruit flower carvings in it but the photos and words were not sufficient to fully demonstrate how to do some of the techniques and I was left wondering. At least with this one, I had a start. Seems that there are many other books out there but they are written in Asian languages that I don’t speak. So, I’ve designed my course to save your valuable time and money. You’ll bypass the trial and error of buying useless, silly books and books that can’t communicate the full concepts. I show you and explain the step-by-step details of how to make beautiful, elegant carvings. Not only do I show you how to make fruit flower carvings and fruit arrangements, but I show you ways to display, garnish and use your carvings in your meals. You’ll be impressing yourself with your first attempts in no time. Where? Not everyone wants to travel to Thailand or enroll in a specialized culinary school to learn to carve fruits and veggies. There don’t seem to be many classes offered in many parts of the world. I know that here in California, it’s a rare cooking school that offers any class at all in carving fruit and vegetables. So, I make it easy to learn from where ever you happen to be, as long as you have access to a computer or a DVD player. With my course you can learn at your own pace, play back the parts that interest you the most. And, you can always refresh your learning with my DVDs months or even years from now. Answer: Yes, vegetable and fruit flower arrangements are edible. Some people take delight in nibbling on food art and some simply enjoy looking at it. Even if your guests don’t eat your fruit arrangements and carvings, they will be amazed, they will talk about them and they’ll remember them. A funny story about that. The first time my 90 year old mother-in-law saw one of my vegetable and fruit flower arrangements made of sweet potatoes and yams she was so impressed that she asked me if she could keep it to show to her friends. I told her that she could steam and eat them. Two months later it was still in her fridge!! She was still proud of showing it even though it had shrunk to look like those dried up shrunken head apple faces you might have carved when you were a kid. HA. I’m sure that by then, no one she showed was impressed. Oh well, it made her happy. 4. Do I need any special tools? Answer: No and Yes. It depends on what you want to create. There are many vegetable and fruit flowers, fruit arrangements and garnishes you can create with knives and tools that you already own. You can get started with those. However, once you see some of the fabulous results you can create quickly and easily with a few specialized tools, you will probably want to get a few for yourself. In our course, we show you how you can create with your existing tools and how you can improve your results with some good fruit carving tools. We discuss which tools you will find most beneficial, what they are called and and where you can get them. We spare you the trial and error of wasting your money on tools that don’t work as promised or that seem cool at first, but then you find that you never use them. Answer: Learn fruit carving now. 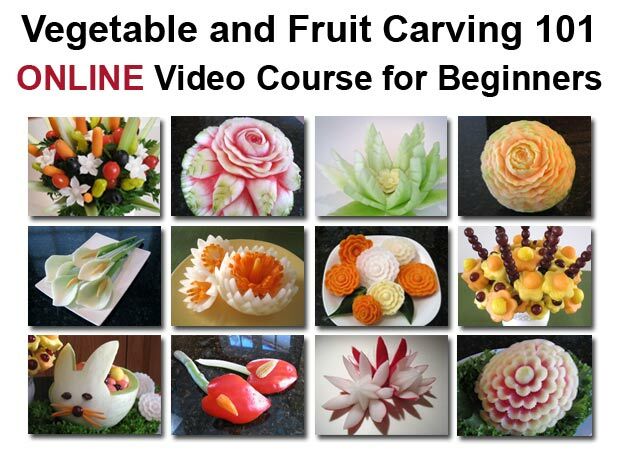 To get started with my free video lesson simply go to //www.vegetablefruitcarving.com. Sign in and your lesson will be on it’s way to you right away and you’ll be making impressive, beautiful food art in no time. 6. Is the Hearts and Roses DVD part of the 11 week course? No. It is a separate DVD that shows several easy carvings that do not require special tools. It is an easy introduction to fruit carving. 7. What is the difference between the corrugated U-cutters and the U-V tools? The Corrugated U- Cutter have wavy edges that make wavy U shaped cuts. The U-V Tools have two ends. One end of each tool has a smooth edged surface that makes a smooth U shaped cut. The other end makes a smooth V shaped cut. 8. Can you notify me when you have new videos available? Yes, just sign in for the free lesson and you will be notified of new videos when they are available. You will also receive occasional emails with tips, tricks, mini-lessons, photos and news of carving events. 9. How can I get free stuff? Sign in for the free lesson. In addition to the free lesson, you will also get occasional mini-lessons, tips, tricks and photos that will give you ideas for creating your own carvings and other food presentation ideas. If you'd like to learn how to make some beautiful vegetable and fruit carvings that don't require any special tools, you might be interested in my Hearts and Roses video lessons. Learn healthy and beautiful alternatives to regular cakes. 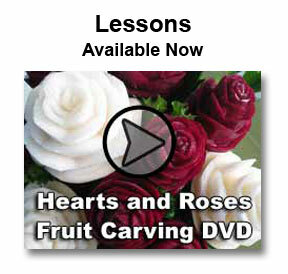 Intermediate Lessons show how to carve smooth and jagged petals, step-by-step. Want to carve impressive watermelons? You can with these easy to follow, step-by-step instructions. You can purchase the U-Cutter and mini-melon baller set here. Copyright © 2009 - 2018 Promotion Media · Wordpress Website Design by Virtually Marj Wyatt.